This week sees the U.N Climate Summit in Paris, where world leaders (over 140 of them! ), scientists and activists are getting together to discuss how we can cut emissions of greenhouse gases. The aim is to limit global warming to the agreed target of 2 degrees Celsius, or 3.6 degrees Fahrenheit, above pre-industrial levels. If global warming goes above this, well, shizz is going to get crazy. To mark the event, Twitter released 3 new emoji’s, seen above. Yay Twitter! Twitter expanding the like option with emoji? According to those in the know, Twitter is testing expanding the ‘like’ or heart button into multiple emoji reactions, similar to how Facebook is currently rolling out Facebook Reactions – buttons other than ‘like’. This is in line with a growing number of people who have a difficult time pressing ‘like’ when a friend or fellow Twitter-er puts something out into the social media world that is not necessarily happy. The rumor is that the heart option on twitter will be reinvented to include a pop up menu that shows a bunch of emoji’s showing an array of emotions. Twitter has so far not commented on this, but we for one think it is a GREAT idea. Hungry? Tweet some pizza to your door! Having a party? Got the Friday night Munchies? You know what is awesome for both of these? Uh, PIZZA. Cheesy, saucy, delicious pizza. YO you should probably order some pizza! Wait, what’s that? You’ve lost your voice? Your computer will only let you type certain keys? UH OH. That’s ok though, bro! Come May 20th, Dominos will be accepting pizza orders through Twitter. All you have to do is tweet  @Dominos. THAT’S ALL YOU HAVE TO DO! After you create a pizza profile, and add their Twitter handle and favorite pizza. BUT AFTER THAT THAT’S AL YOU HAVE TO DO! Bro! So….Pizza party May 20th guys? Tech of the week! Check out Charitweet! Right now at iPhone Antidote, we’re all about creating good in the world, and here is a great way to contribute to that. Charitweet is a fantastic way to empower your social network as a force for good in the world, providing you with a simple way to give to your favorite charities, whilst encouraging others in your social network to do the same. The Boston based company is making it possible to give 100% of your donation to your chosen charity through Twitter. Skip the middlemen, give in 140 characters, spread the word, and you’re done. Giving is good. Simple giving, where 100% of the donation goes to the charity is great. After your first Charitweet, you’ll receive a notification on your Twitter account. You’ll complete a billing form (asking only necessary information that will remain completely confidential). After that first tweet, you’ll never have to do more than tweet to donate again! Here’s a list of the Charities that Charitweet are partnered with currently. You can also contact them to request that another Charity you might have affiliation with could partner with Charitweet in the future. The only caveat is that in order to donate, your Twitter account can’t be private in order to process your donation, but that is something the company is working on getting around. If you’re looking for a way to give in 2015, do yourself a favor and check out Charitweet. Spread the word! So guys, it’s almost 2014, which means it’s almost the future, right? And what better way to realize that then by realizing that sharks are now using Twitter? Yup, You heard us correctly. Off the coast of Western Australia there are 320 sharks ( Great Whites included) outfitted with transmitters that automatically update Surf Life Saving Western Australia’s Twitter feed when the sharks get too close ( within 0.6 of a mile) to any of the coast’s popular beaches. The move is to keep surfers and swimmers safe and aware of the sharks’ presence, which is vitally important with 6 deaths due to shark attacks off Western Australia in the past two years. We love this. Sure, it’s a program designed to protect life and it seems to be working and all that good stuff, but it’s also sharks sending tweets. Twitter IPO! It happened! And it was good! The Twitter IPO happened this morning! Lots and lots of money was made/exchanged/flurried about, and people were happy! Yay! The bell was rung by Sir Patrick Stewart, Cheryl Fiandaca from the Boston Police department and Vivienne Harr from the charity Make A Stand Lemon-aid (An awesome charity btw, check it out here). The stocks started selling at $26 a share but soon shot up topping out at $50.09 and closing the day at $44.94, up 73%! Way better than Facebook (although concerning less money) and better than we think some people were expecting. Twitter is now worth about 25 billion dollars. That’s a lot of clams, kids. And that’s awesome. Well done Twitter! Images courtesy of USA Today, OMGCUTETHINGS & Clams. Apple CEO Tim Cook has joined Twitter! Hooray! Actually, he joined back in July but waited until the day of the release of the iPhone 5C and iPhone 5S to send out his first Tweet. We wonder if there was perhaps a few more gold iPhone 5S available at the Palo Alto store with so many happy customers? 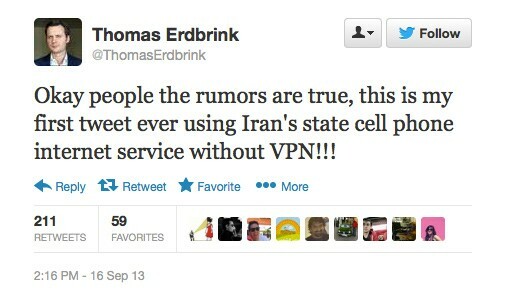 Iranians can use twitter now! As of Monday, Iranians can now access Twitter and Facebook for the first time since 2009 when their government blocked social networking sites. As we know most famously from the Arab Spring, social media can be used to raise awareness and to organize protests in times of uncertainty, to try to uprise against repression and to rally for hope in times of conflict. Before any of that happened, this specific use of social media use was seen in Iran. In 2009 there was a presidential election won by Mahmoud Ahmadinejad that many believed to have been fraudulently won. People began protesting, and these were described as the biggest since the revolution in 1979, with hundred of thousands (if not millions) of people protesting. It was named the Green movement. The Iranian government soon became aware that sites such as Facebook and Twitter were being used to organize their protests against the regime, and they shut access down. Since then, people in Iran who wanted to access the sites had to use complicated software such as virtual private networks in order to bypass the firewalls put in place by the government. Three months ago, Iran held elections which saw Hassan Rouhani take the office of president on August the 3rd. Rouhani is seen as being much more moderate than his predecessor, and the government under his leadership has said that it will be liberalizing the internet and improving online access for all Iranians. This seems to be the beginning. So far not all parts of Iran have access, and not all social media sites are unblocked, but in our humble opinion, this is an excellent start. Twitter is an online networking service, microblogging service and a hugely popular social media company that enables its users to send and read text-based messages of up to 140 characters known as “tweets“. Whether or not you’re on the Twitter ride, you probably know this much. If you dream in tweets, organize your awesome too-late comebacks, fame catapulting strategies and pop culture observations and everyday life rants into 140 words, then you probably know a little more. The company has gone from strength to strength since it’s creation by Jack Dorsey in 2006 thanks to tweetaholics such as you, marking over 200 million monthly active users last December. Cool. Now can you tell me what that means in 140 characters please iPhone Antidote? Well…. no. As much as we love Twitter, we’re not very good at doing that 140 character thing. We talk a lot if you haven’t noticed. BUT we’re kinda ok at explaining things, so here’s what Twitter going public means, and how it might affect you, dear tweeters. First things first. IPO stands for Initial Public Offering. It is basically a stock market launch where members of the public (that’s you, if you gots the cash) can buy shares in the company (that’s Twitter) on a securities exchange ( think of Wall Street). Members of the general everyday public will make up some of the people who buy shares, but Twitter will also be looking for big time BIG TIME investors to buy shares. Lots of them. For lots of money. Cos, monies. With monies, you can build. and they will come. Not really, sorry, we just watched Field of Dreams. But with money, otherwise known as capital, twitter can grow and build and become a better company and provide more for your trusty shareholders and the 200 million + users. So, basically, Twitter is now a private company, and they are planning on becoming a public company. Simple, really, except it’s pretty huge, as the beginning of the process is and has been for a while a hugely anticipated moment in the tech, financial and tweety world. But… why are they doing it? The advantages of becoming a public company are many, and they’re mostly to do with money, but also reputation and growth. With new investors, the company will be able to access a large amount of capital to catalyze growth. It’s a way of monetizing parts of the company. It will make acquisitions easier and increase the company’s (already huge admittedly) public image . People who invested in Twitter in the beginning and employees will be able to assign a value to their shares, making their association to the company increasingly valuable (hopefully). Shares in the company can also be used as an extra attraction for potential employees, as long as the value is set to open and stay high. There are also potential disadvantages. The company, once public, will have to disclose business and financial information, which is of course useful to shareholders, but can be risky as they also expose the business to it’s competitors. The stocks could dive. There’s risk associated with Twitter’s reputation and there will be pressure for them to fulfill their promised potential. Now, Twitter has filed their ‘S1’ confidentially, which means that they make less than $1 Billion dollars annually. If a company earns more, that is when they have to file the S1 out in the wide open plains of the tech and financial world. Twitter will have to make their IPO documents public, but not until 21 days before they start pitching themselves to investors on Wall Street. One way to attract investors before and during the official pitch is to convince them that Twitter, like Facebook before them, can advertise in this new social media world better, more subtly and more effectively than any other social media company out there. They’ve only quite recently started to gain revenue from placing ads in the stream of tweets users see, but it’s already significant. According to eMarketer, they’ll haul in $583 million in advertising revenue for 2013 and hit $1 billion in 2014. They are said to be creating a type of advertising that will work better than any other social media advertising.They have just purchased MoPub, the world’s largest mobile ad server,which is indicative of the direction they’re going in making huge advertising profits and attracting investors. Speaking of Facebook, their IPO famously did not go very well. After they initially started selling their shares at $38, the company’s share prices dropped by more than half over the following 3 months. Investors lost billions and blamed Facebook and the investment banks involved in the IPO, claiming they had deceived them on Facebook’s revenue estimates. Facebook has however recently recovered, currently sitting at $44.75 as we write this. Twitter will be super keen to show potential investors that their revenue is and will be exponentially increasing. In the near future, expect to see more ads on twitter, and advertising used in different ways within the platform. You’ll probably start hearing a whole bunch about Twitter going public. As for when Twitter will take the jump to being a public company? Well, that depends on how attractive they’re looking, and how the stock market is performing. They will want the best conditions to get the best price. For now, Twitter is going ‘back to work’.